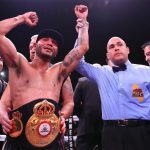 The post What’s Next for New Champion Andrew Cancio? appeared first on Round By Round Boxing. PreviousWhat’s Next For Former Champion Alberto Machado? NextWhat’s Next for Erickson Lubin?